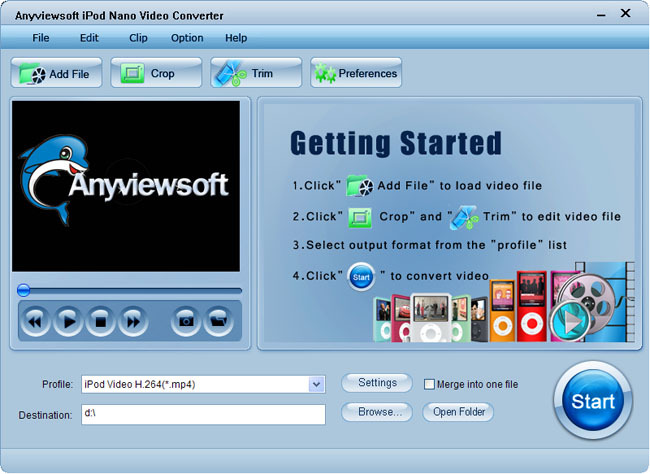 Anyviewsoft iPod Nano Video Converter is all-in-one solution to convert all kinds of video formats to iPod nano video format in hith quality such as convert AVI to iPod nano, WMV to iPod nano, VOB to iPod nano, MP4, M4V, MKV, MPG, TS,VOB, DAT, RM, RMVB, ASF, 3GP, 3G2, FLV, SWF, MPV, QT, MOV, etc to iPod nano. Moreover, the Nano Video Converter can also extract audio from video file and convert them to AAC, WAV, M4A, MP3, AIFF for iPod nano. ...... AIFF for iPod nano. Anyviewsoft iPod Nano Video Converter supports all iPod nano types including iPod nano 2,iPod nano 3, iPod nano 4, iPod nano 8G, etc. Anyviewsoft iPod Nano Video Converter is also multifunctional video editor software comprising functions of Video Joiner, Video Splitter and Video Cropper. Qweas is providing links to Anyviewsoft iPod Nano Video Converter 3.2.16 as a courtesy, and makes no representations regarding Anyviewsoft iPod Nano Video Converter or any other applications or any information related thereto. Any questions, complaints or claims regarding this application Anyviewsoft iPod Nano Video Converter 3.2.16 must be directed to the appropriate software vendor. You may click the publisher link of Anyviewsoft iPod Nano Video Converter on the top of this page to get more details about the vendor.